Over the years, China Import and Export Fair (Canton Fair) is not only good in economicareas for Guangzhou, Guangdong Province and the country, but also for people's lifestyles, urban character, etc. As the main stage of China's foreign trade, the Canton Fair in plays a huge role in the world economy. Each area of 340,000 square meters, three total exhibition area of over 1.11 million square meters, over 55,620 international standard booths makes Canton Fair the first exhibition in Asia, the world's third exhibition in the world. WuhanWellsee New Energy Industry Co., Ltd. will attend first phase of Canton Fair from October 15, to 19. Our booth number is 5.1G40. Our company will display WELLSEE solar products, including the company's well-known brand WELLSEE solar controller, solar inverter , solar panels, and other high-tech WELLSEE car products. Canton was founded in the spring of 1957, held in Guangzhou every spring and autumn, so far, it has nearly five years of history, For it’s the oldest, largest and most completed,,largest attendance and businessturnover， Canton Fair becomes the best comprehensive international trade Fair. The scale will be the same with 109th, total 116 square meters area, 58.6 thousand booths, 58 thousand export booths, 20 thousand square meters import area. This Fair will focu on the company quality and goods quality. First, export rate of the exhibitor is more than 80%, the annual renewal rate of more than 5%. Secondly, to promote the cooperation of the trade group and the local quality supervision departments to strengthen the quality of the exhibits before the fair. This Fair will going to build the control measure of the products quality and trade disputes. In the invitation of buyers, the BRIC countries currently represented by the emerging market countries will be more like to attend Canton Fair. United States, Canada, Switzerland, Denmark, France, Britain and other developed markets buyers have expressed strong willingness to participants. This year, the world economy faces a very complex situation, including the spread of European sovereign debt crisis, rising countries inflation in emerging, the Chinese mainland outbreak of natural disasters and inflation pressures increased, but the Ministry of Commerce uses the "Canton Fair" implementation to achieve the "stable external demand, adjusting structure, promoting balance. According to reports, the cumulative effect before the 109th Canton Fair nearly $ 900 billion, buyer nearly 600 million. Wuhan Wellsee New Energy Industry Co., Ltd. Established on 2007, focus on production of PV products with high quality.Currently, WELLSEE company has appropriated a large land to build PV production base --WELLSEE (China) Photoelectric CO.,LTD , the base located in national high-tech development zone, covering 68 mu(45,333.33 square meters), with the aim to build a modern garden-PV Series Development and production base. The major construction projects of WELLSEE PV production base include:Office buildings, staff dormitory , executives residential building, staff canteen, research buildings, manufacturing workshop. The Infrastructure construction expense is more than 50 million yuan, and production equipment and working capital are more than 80 million yuan. After the company established, it can solve the local employment problem, hire more than 500 people. Besides, the company profits and taxes will exceed 100 million. On July 2011, for the majority of domestic users the company chairman Mr. Luo Bang invested more than 100 million for setting up branches in Shenzhen, and purchased a full set of test equipment, photovoltaic systems. Customers can test , saving the customer time and expense to purchase samples. Since then the company can delivery all goods from Shenzhen, will save substantial shipping costs for customers. Wuhan Wellsee New Energy Industry Co., Ltd. has been researching and developing new energy solarphotovoltaic systems, solar controller, solar inverter , car inverter and other high-tech product. its products are widely used in solarphotovoltaic systems, solar street lighting system, solar lawn lights, solar garden lights, energy saving lamps, automotive electronics. Products are exported to Europe, America, Africa and other regions, while an absolute radiation intensity in Asia. 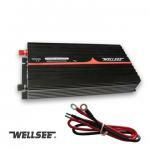 WELLSEE becomes the PV industry leader. This is also the reason why Ministry of Commerce warmly invites us to attend Canton Fair. WELLSEE solar photovoltaic series have more than 50 products: Its advanced technology, superior quality, excellent service won long-term trust and support of buyers, trader. The best sellingWELLSEE solar charge controllers, solar sine wave inverter are exported with large quantity to Europe, America,Australia, Africa. 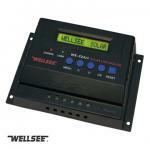 WELLSEE products plays a decisive role PV industry . 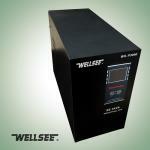 WELLSEE products sold to more than 50 countries and regions, got deeply domestic and foreign customers praise. Our company will displayWELLSEE solar products, including the company's well-known brand WELLSEE solar controller, solar inverter , solar panels, and other high-tech WELLSEE car products. .
Ms. Ava will lead company team to attend the 110th Canton Fair with sales managers. As the well-known PV industry important company, Wuhan Wellsee will open a brand new market. "Promote energy saving and builde a conservation-oriented society, WELLSEE first PV choice " WELLSEE compan welcome you to our booth. Wish the 110th Canton Fair a great success! Welcome new and old customers to visit our booth!